LEVLcare • Blog • What is the Paleo diet? Why are discussing cavemen eating patterns now? The Paleo diet is modeled after a prehistoric diet that may have been what our Homo sapien ancestors ate in the Paleolithic era (2.5 million to 10,000 years ago). This diet is limited to eating lean meats, fish, fruits, vegetables, nuts and seeds, while avoiding corn, grains, dairy, and processed foods. Eating the foods these hunter-gather ancestors would have had access to may help modern dieters lose weight, reduce heart disease, and promote a healthy lifestyle that includes daily activity and drinking plenty of water. What are the benefits of following a Paleo diet? Many people claim that eating Paleo has helped them reduce inflammation in the body, others say that it reversed their autoimmune diseases, aided with digestive issues, gave them more energy, helped with hormone imbalances, and of course, lose weight. If you find it easier to stick to a list of foods you can eat and avoid those you can’t, without worrying about portions or calorie counting, you might have success losing weight on a Paleo diet. This diet can work if you follow it correctly, but you need to have discipline and really change your mindset. No more “cheat days” or “cheat meals.” In order to see and feel results, you have to follow the eating plan consistently. One of the main concepts behind Paleo is that eliminating grains can help those who are gluten intolerant reduce medical conditions like joint pain, acid reflux, and more. Those following this caveman, Paleolithic diet can eat the following foods: fruits, vegetables, seeds, nuts, lean meats–particularly grass-fed animals or wild game, fish (especially those rich in omega-3 fatty acids, such as salmon, mackerel and albacore tuna), as well as oils from fruits and nuts, such as olive oil or walnut oil. Some Paleo dieters eat omega-3 enriched cage free eggs and sweet potatoes or yams as well. What foods are not allowed on a Paleo diet? Simply put, probably most foods on your shelf and in your freezer. Paleo diet followers avoid grains, such as wheat, oats and barley; legumes, such as beans, lentils, peanuts and peas; dairy products; salt; sugar; and highly processed foods. Can a Paleo diet help you lose weight? Yes, and it may help blood sugar levels as well. 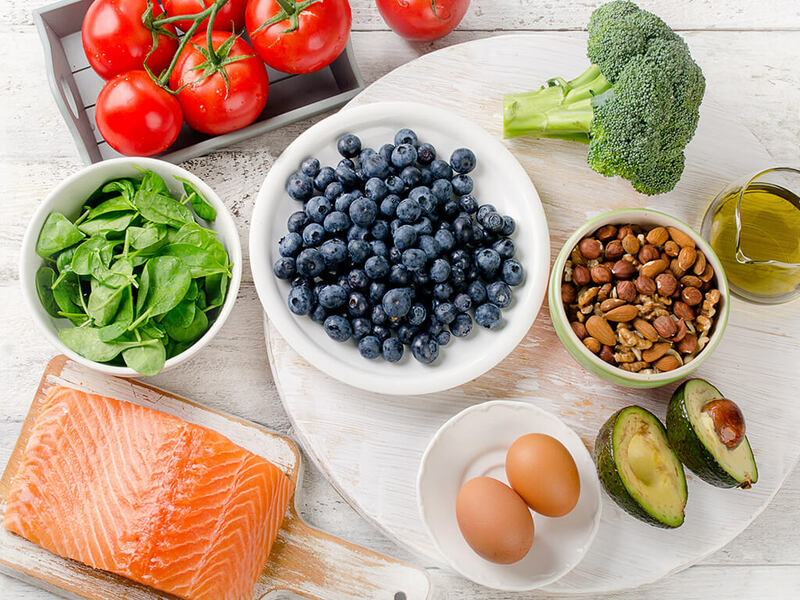 According to the Mayo Clinic, research finds that a Paleo diet may provide some benefits when it’s compared with diets of fruits, vegetables, lean meats, whole grains, legumes and low-fat dairy products. Those Paleo diet benefits include weight loss, better blood pressure control, lower triglyceride levels, glucose control and better appetite management. When you’re cutting out a ton of junk, processed foods and sugar from your diet, you’ll be less likely to get those blood sugar spikes and energy levels that soar and then dip drastically.